Chris Kyzar, a very dear friend of ours is putting this event together for local families. If you and your family would like to come it will be a great event. They are planning a bonfire, a football game, live music, and a presentation of the gospel from an incredible young man. It will be a great evening to get out and spend quality time with your family. ﻿The event is Saturday, November 12th, is 4:00 pm to 10:00 pm. Admission is completely free. We will be fundraising for our adoption at this event. We will be selling World's Finest Chocolate Covered Almonds for $2 a box. We will also be selling raffle tickets for an iPad2 for $5. The drawing will be on December 5. 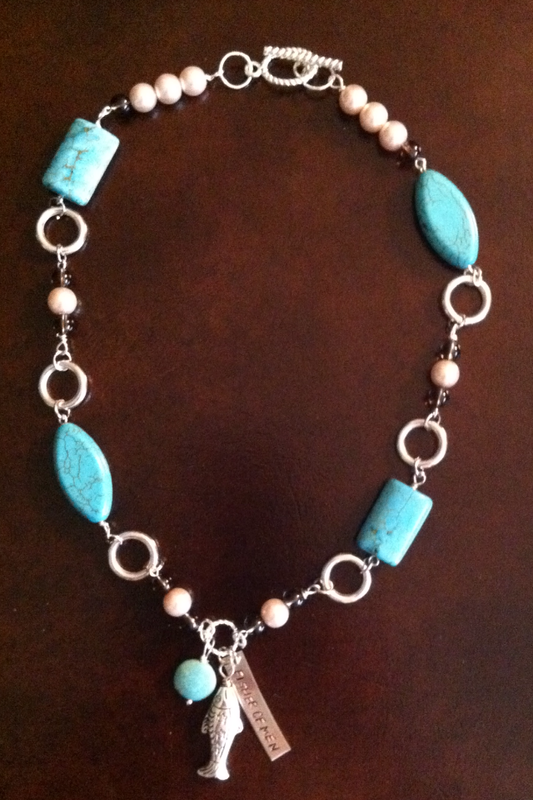 Another fundraiser we will be doing is raffle tickets for a necklace that was handmade for us. 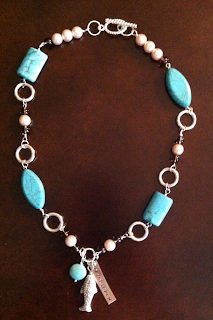 This beautiful necklace is made of faux pearls and turquoise, real smoky quartz and the tag that says "fisher of men" is hand stamped. It was hand made by D’Nae Cherry of Celebrations Hand-Stamped Jewelry. You can check out more of her work on Facebook. Raffle tickets are $5.00 each. The drawing will be held on December 15. We also have a friend who is making some Christmas ornaments. If they come in before November 12th we will be selling those as well. I will post a picture as soon as I have one. I want to say thank you to everybody who helped us with donations and purchasing tickets for the spaghetti lunch. We cleared roughly about $440 with the cash we collected for that day from donations and ticket sales. We are that much closer to bringing a girl into our home and giving her a chance to change the course of her future. Those who consider themselves religious and yet do not keep a tight rein on their tongues deceive themselves, and their religion is worthless. Religion that God our Gather accepts as pur and faultless is this: to look after orphans and widows in their distress and to keep oneself from being polluted by the world. Challenge yourself this week to think about what you say to and about those around you who might need a word of encouragement instead of words that hurt and degrade. Be open to the Lord's prompting to help someone in need. Offer a hand of friendship and the gift of a heartfelt smile to people around you.